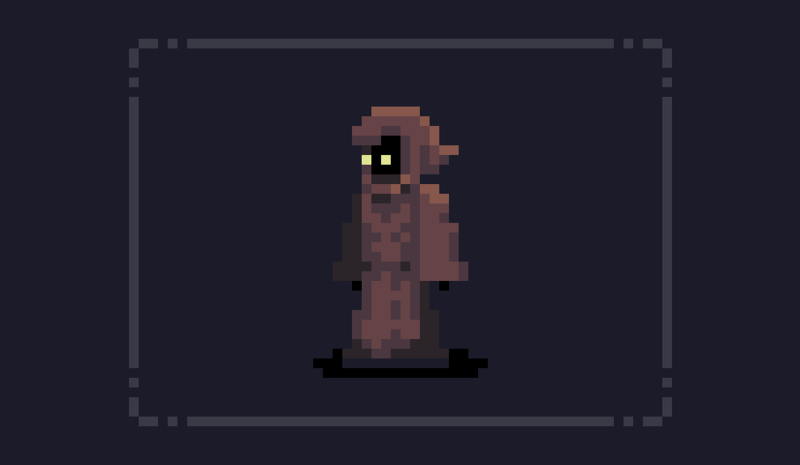 The underworld boss is a mysterious, hooded figure. He shoots magic at the player and has the ability to teleport. This is the first draft of the underworld boss sprite. After making this sprite there were two things missing: Magic effects for his attack, and an anticipation for his attack. So first I added an anticipation move. Before stretching his arms outwards, the hooded figure ducks a little to build up the attack. This will give the player a queue that an attack is on the way. This is the second draft of the underworld boss sprite. An anticipation animation was added before the attack. After adding the anticipation move, I added magic effects to the sprite. Since the underworld contains green demon fire, it makes sense the boss also uses this. This is the third draft of the underworld boss sprite. Magic effects were added. 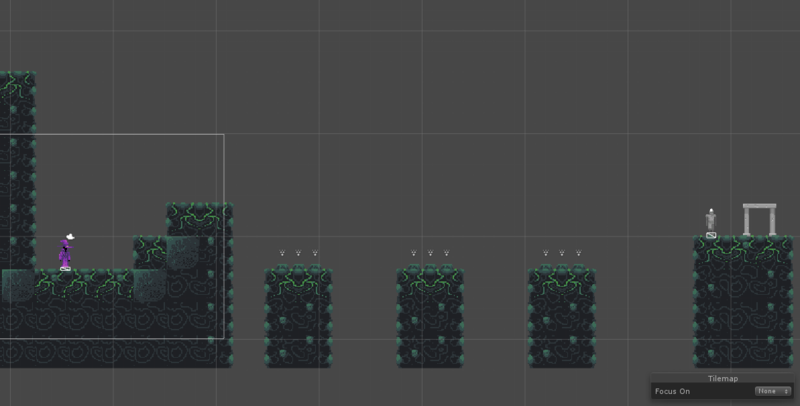 More level designs for the underworld! Keep in mind these are not final and might be changed before release. Getting rid of an enemy is NOT always what you want do. In this case, when the enemies touch the fire crater, they will die. And that prevents them from walking over the switch. So be careful, timing is key in this puzzle. Speaking of fire craters… How many boneheaded enemies does it take to introduce a new mechanic? One. This is the first encounter with the fire crater. Anyone who hasn’t seen one before could not possibly know they will die while standing on it. That’s why I use this enemy to demonstrate what happens. Here’s the most recent level I made. 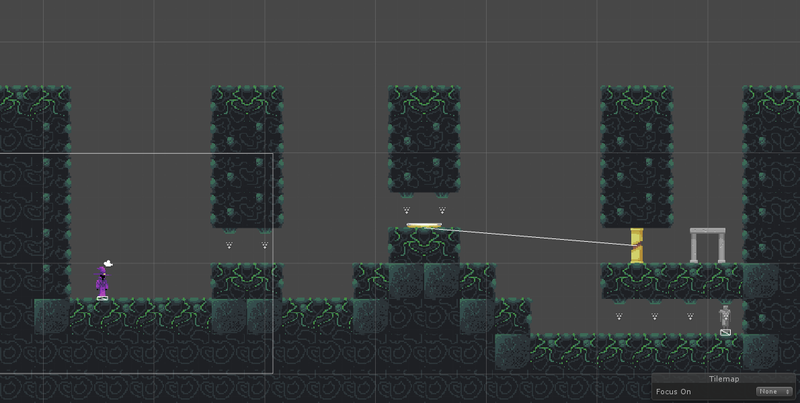 The level is shaped like an X and this method got me thinking: Maybe there are other shapes that would make interesting and fun levels. As not to spoil too much of the new content, I won’t show the rest of the levels. The underworld will probably contain somewhere around 10 to 15 levels, including a Boss fight. If you have any questions or suggestions, please leave them in the comment section below. 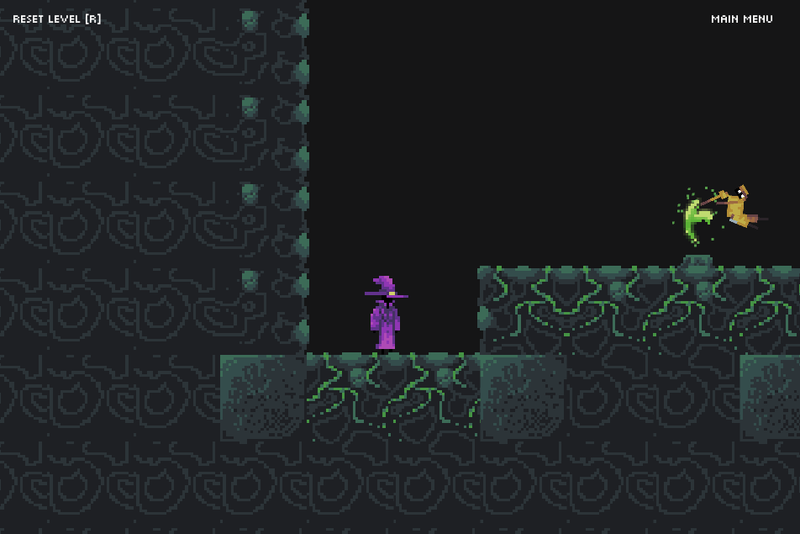 Will Hat Wizard get a level editor? 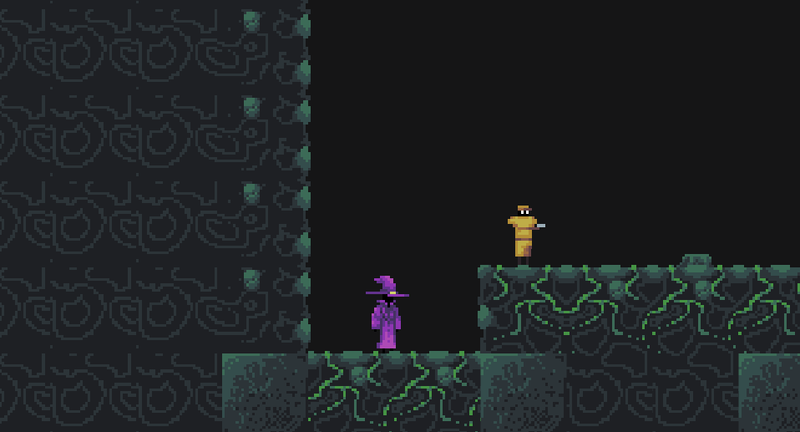 In the upcoming months I’ll be working on extra content for Hat Wizard 2, which will also serve as a test for mechanics and ideas for future games. This week however, I would like to discuss a couple of ideas I have for future Hat Wizard games. 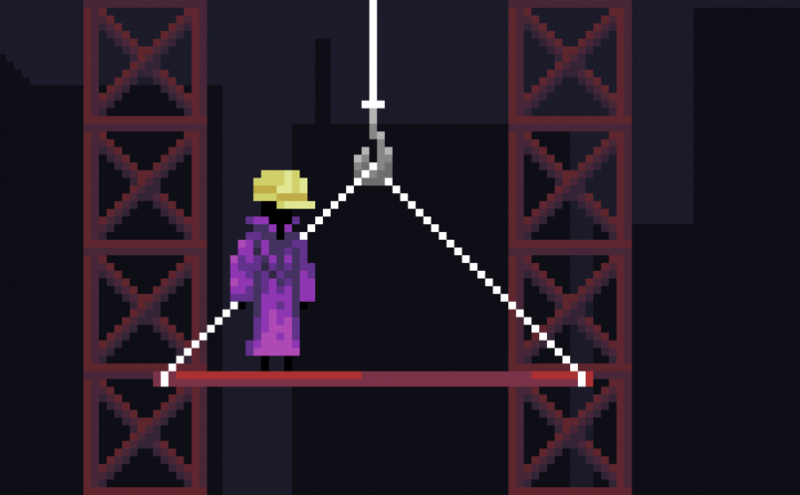 Hat Wizard Creator will be a game where you can create and share levels. You can browse through the levels of other players and play/rate them. You’re also able to unlock new objects and themes for your own levels. 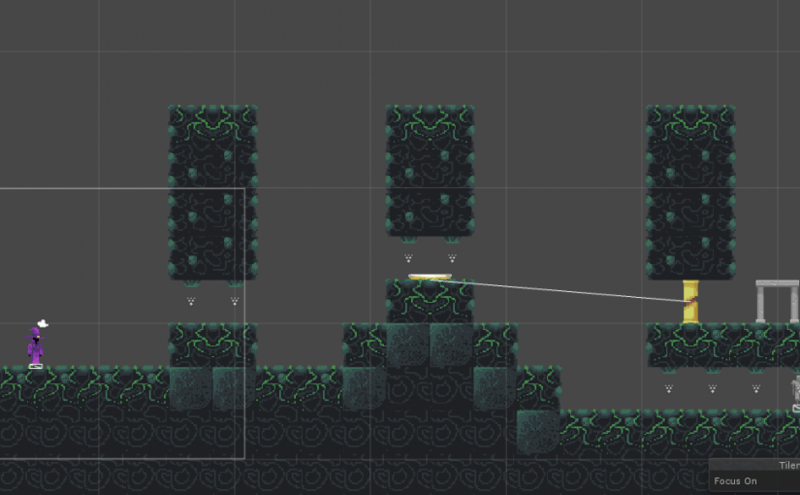 The idea of players being able to create their own levels is very exciting to me. At the moment Hat Wizard is a browser game. It would be interesting though if the game made a leap towards desktop. Benefits of this involve a bigger view port and heavier processing power; meaning that you can see more stuff on your screen, which leads to larger (not longer) levels. So you’ll be able to see enemies coming from farther ahead, to name one example. The desktop version for Hat Wizard would also feature a level editor, or even a modding API. The cool thing about Steam is the possibility for integration with the workshop, allowing you to share levels or mods with others. Hat Wizard Creator, which allows you to create and share your own levels. Hat Wizard Desktop, which is more story driven but also allows you to create your own content. This one comes with the added benefit of desktop power. And be sure to like Hat Wizard on facebook. This way you’ll be notified when a new blog post or video is released. I’ll also set up the occasional poll there, so you can vote on features or blog topics. Posted on May 21, 2018 May 21, 2018 Categories Level Editor1 Comment on Will Hat Wizard get a level editor? Fire craters, fire craters everywhere! I’ve been experimenting with the fire crater a lot. 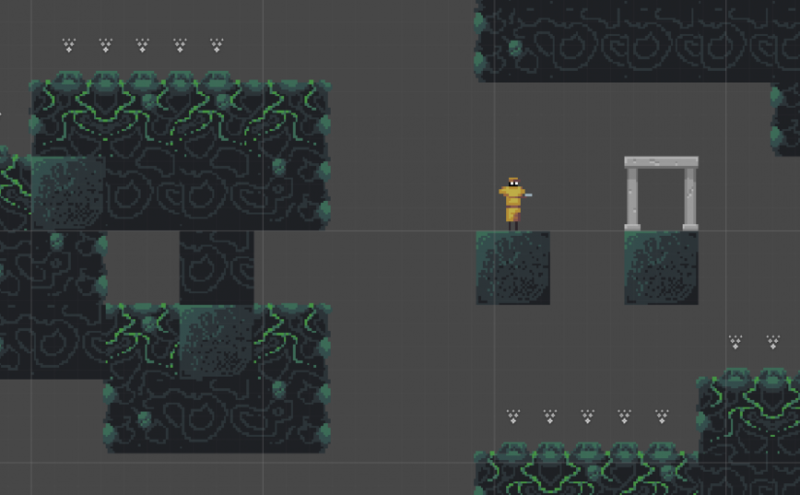 Here are a couple of level designs for the underworld. Some levels won’t be difficult to clear, the challenge rather being: “How can I get rid of my enemies in a fun way?”. When switching enemies on top of a fire crater, they are launched into the air. When standing on one of these pillars the fire craters on top will spit fire. So no standing still. The underworld will be death themed extra content for Hat Wizard 2. Hazards in the underworld will be death themed. Of course Hat Wizard will find creative ways to turn those into enemy killers. The image below is what I call the fire crater for now. Standing on the crater will cause it to retreat for a brief moment, after which it spews demonic flames. I’m thinking it could be fun to either have this burn foes or launch them in the air. The latter would require a more explosive animation though.